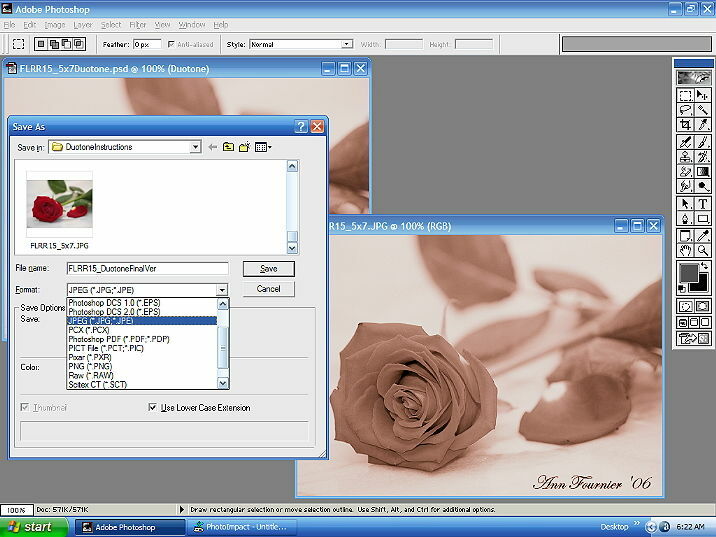 Instructions for creating a duotone image, resizing and preserving the exif info in PhotoShop. 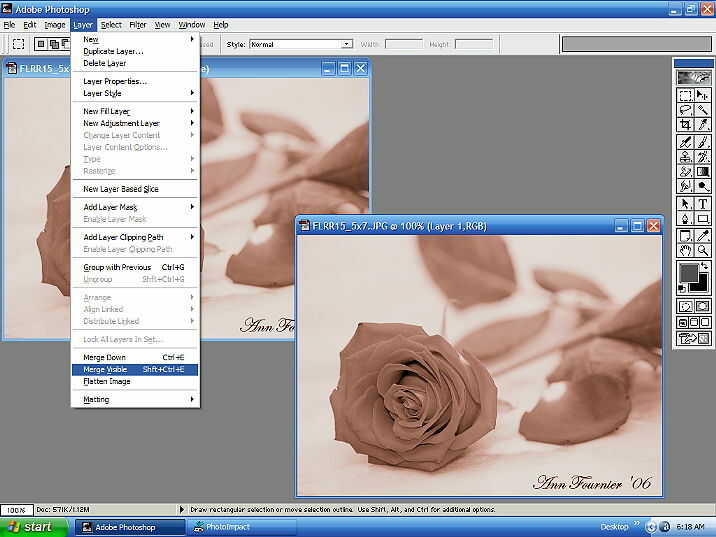 I noticed that Phoshop doesn't preserve the exif when changing and saving a photo. 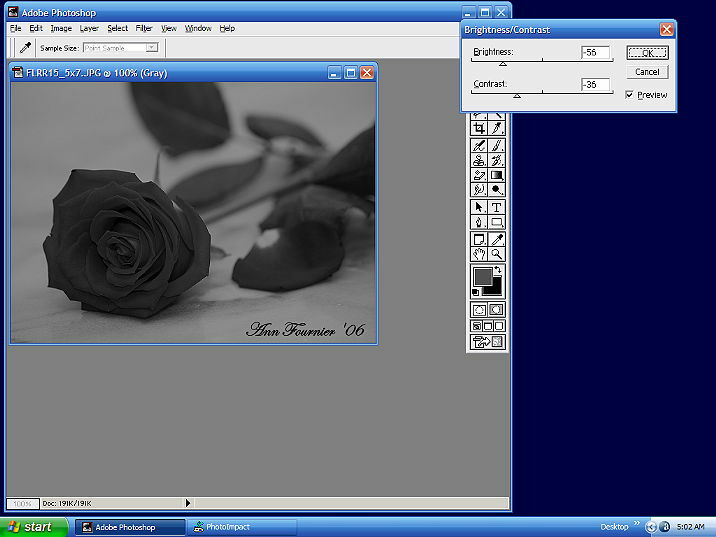 I also noticed that when converting a photo to grayscale or duotone I can't save it as a jpg. But I have found a way. 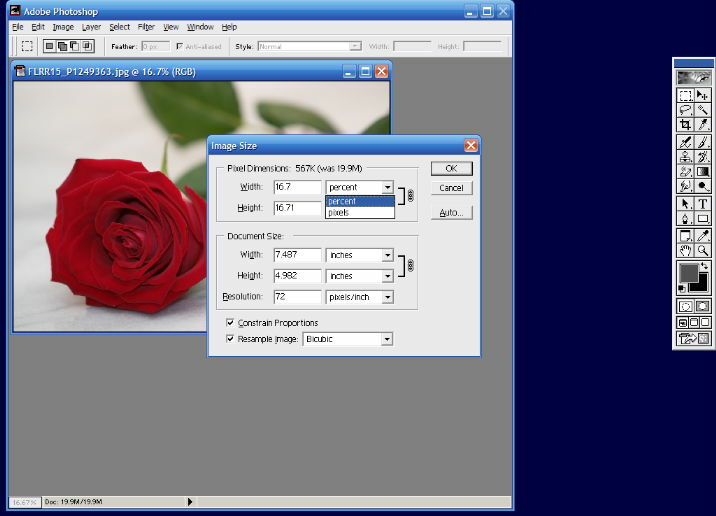 This will also work in PhotoImpact. 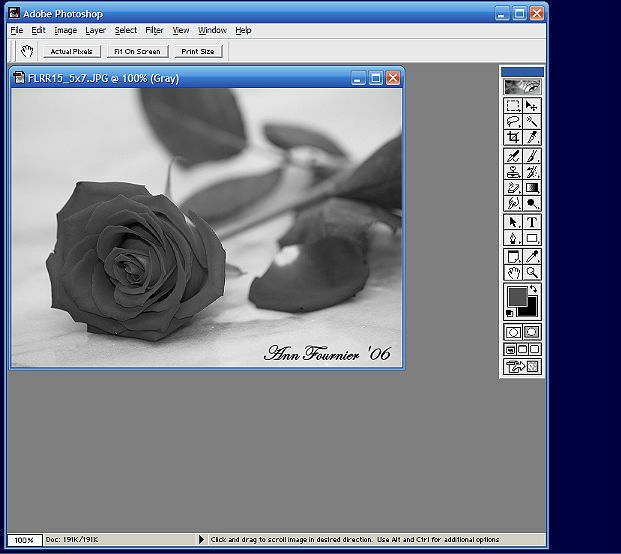 Open the original file you want to work with. Immediately save it to a different file name and close out the original (to keep from accidentally overwriting it). Save it again so you have another of the same photo, but with a different file name (you're going to bring the 2nd file up later). 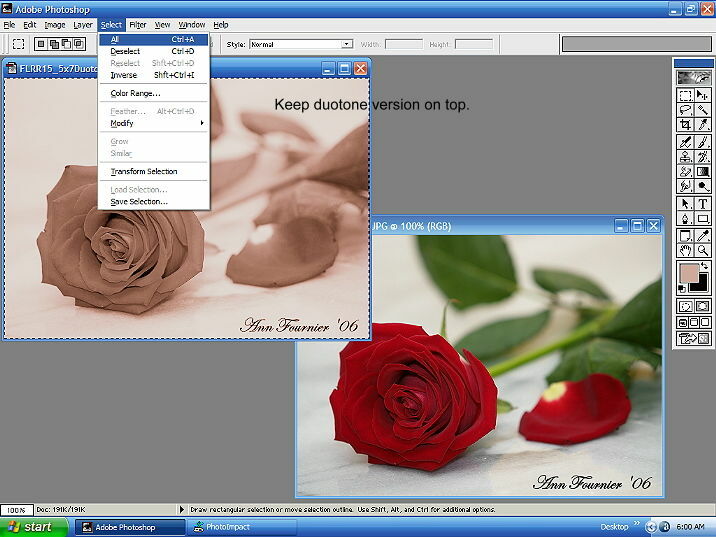 IF you want to resize it (make it smaller), click on "Image", then "Image Size..." as shown in the illustration below. If not resizing, go on to step 6. If you're just embedding the exif, go on to step 16. A box will appear as in the illustration below. See where it says "16.7%"? That tells me that I'm viewing the photo at 16.7% of it's original size on the screen. In the "width" and "height" boxes you will put the % you'd like the file to be shrunk down to. In this case I just chose the view size, so that is what the size will end up being. Click "OK". If you want it larger, just choose a different % and change it until you're satisfied with the size. I don't know how your computer works, but this is what happens after I resize. It's not really going to be that size. For some reason it just shows up that way. 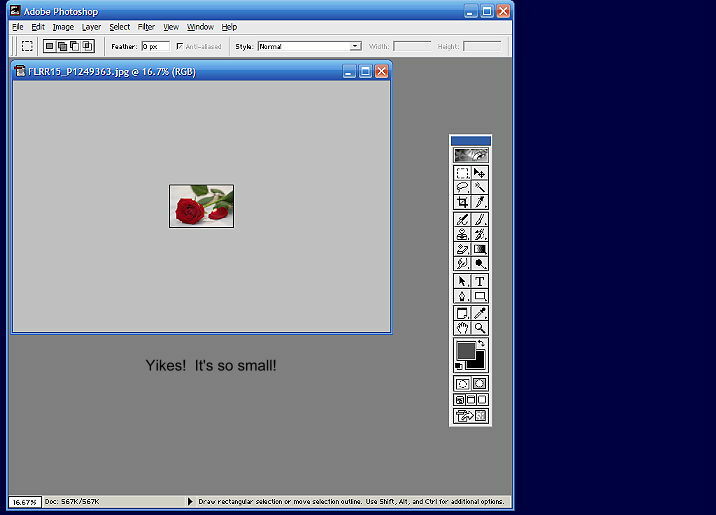 Click on "View", then "Actual Pixels". Your photo will now display at the actual size you chose, as shown in the illustration below. Since it was resized, save once to the current file name, and again to the other filename. That way when you bring up the 2nd one later it'll be the same size. First we need to change the photo to grayscale. Click on "Image", "Mode", "Grayscale" as shown in the illustration below. A box pops up asking to discard color information. Click "OK". Here is your grayscale image. Go to Step 9. Now we'll change it to duotone. Click on "Image", "Mode", "Duotone..."
Here is what we get. 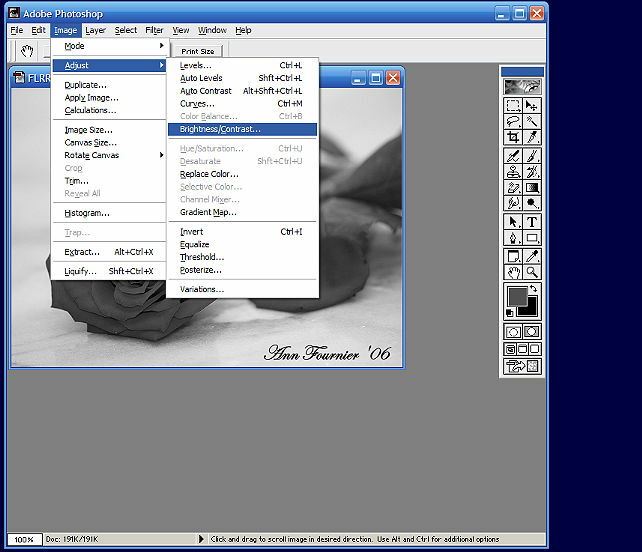 I forgot to include it in the photo, but see where it says in the Duotone Options box "Type"? Make sure you choose "Duotone" from the drop-down menu. You might not have 2 colors show up, but that's ok. It shows two colors here (below) because those are colors that I had chosen for a previous photo. Uh oh, my photo seems a bit light, so I'll cancel the Duotone Options box for now and go on and work on darkening my photo (next step). 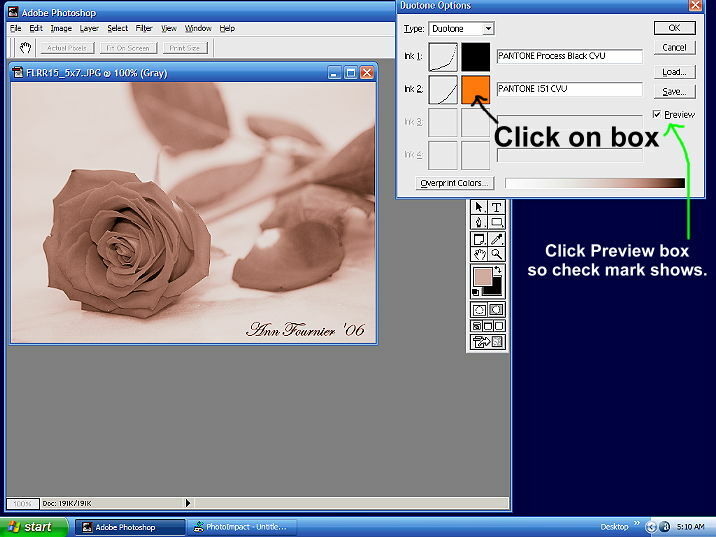 If you don't need to lighten or darken your photo, go on to Step 13. 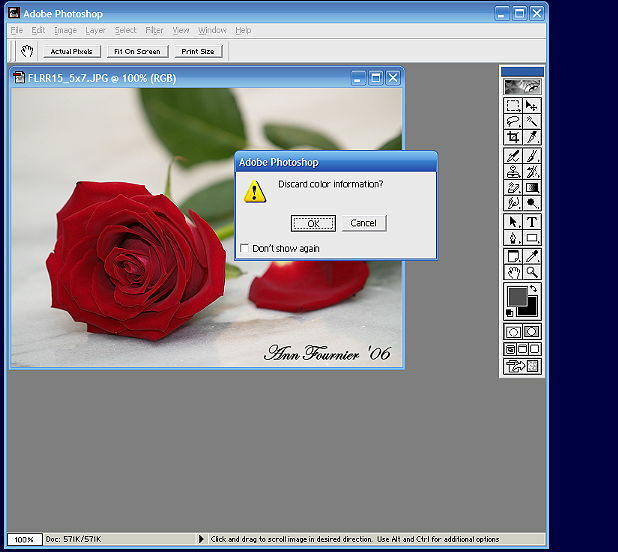 If your photo looks fine the way it is, then you won't need to make any adjustments. But if you do want to change it, here's what to do. Click on "Image", "Adjust", "Brightness/Contrast..."
A box with 2 different slider levels pops up. Slide the triangles in different directions to get the results you want. I had to go backwards a few steps after applying my duotone colors to see how it looked. I chose these levels of darkness for my shot. Be sure to check the "Preview" option so you can see how it looks as you're working. Click "OK" when you're satisfied. It seems a bit dark, but looks better in duotone (to me, anyway). Going back to choosing your duotone colors, again click on "Image", "Mode", "Duotone..." and the Duotone Options box pops back up. Checkmark the "Preview" box so you can see how it looks as you're working. 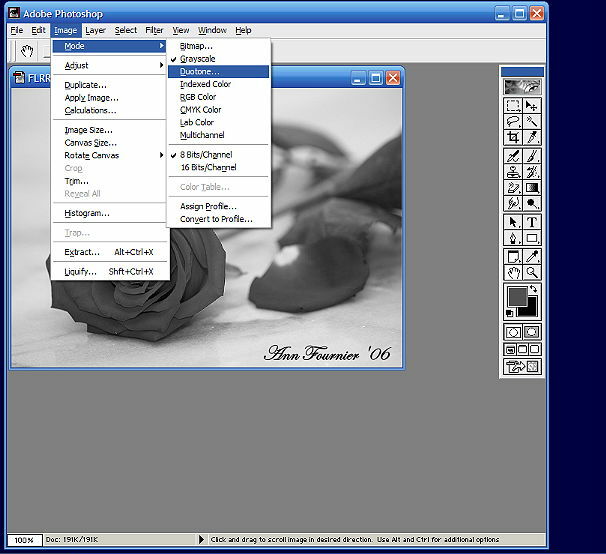 Make sure "Duotone" is chosen in the "Type" drop-down menu. Click on the "Ink 1:" box. 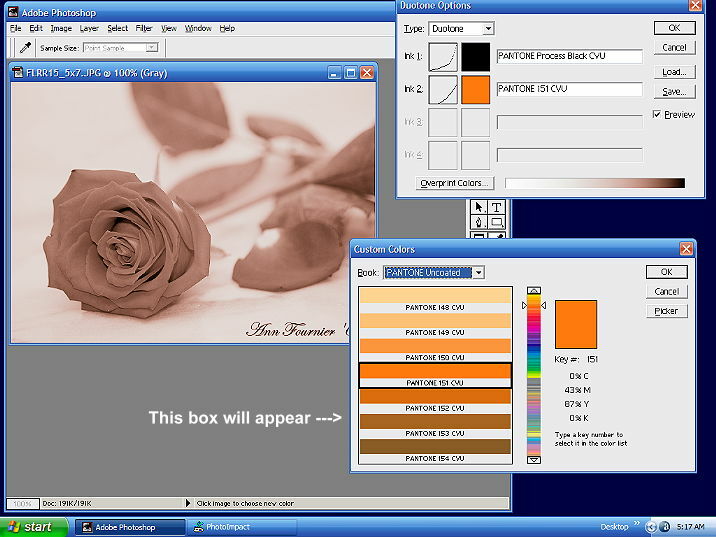 When you click on one of the color boxes a color chart will apear as in the illustration below. Play around with the colors and choose the ones you want to go into each box. You might have to give that color a name in the space next to the color box. Click on the "Ink 2:" box and choose a color. You might have to give that color a name as well. You might not have Pantone colors, so click on the drop-down menu and you'll have other choices. When you're done choosing the colors you want, click "OK". You're ready to copy. Bring up your 2nd saved file and leave it in the background for now. 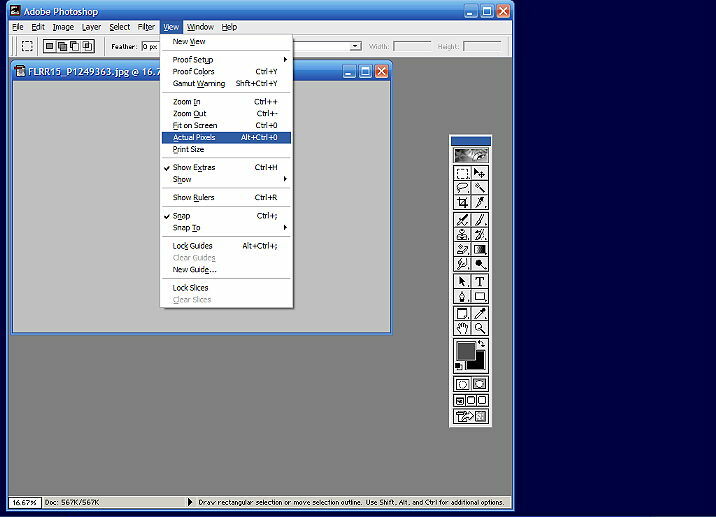 In the file you've been working in (or the 1st one) if just embedding, choose "Select", "All". A blinking dotted line will appear all around your image. Click on "Edit", then "Copy". You have now copied this image to your (invisible) clipboard. Click on the other photo version to bring it to the forefront. 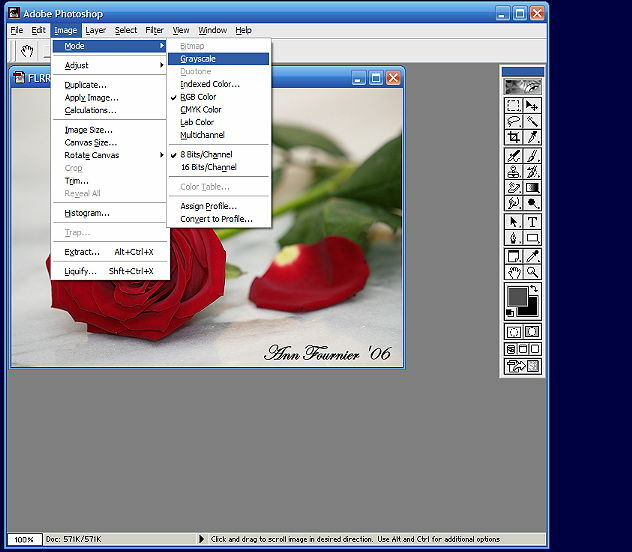 Click on "Edit", then "Paste" as shown in the illustration below. The copied version should now be on top of the original version as shown in the illustration below. 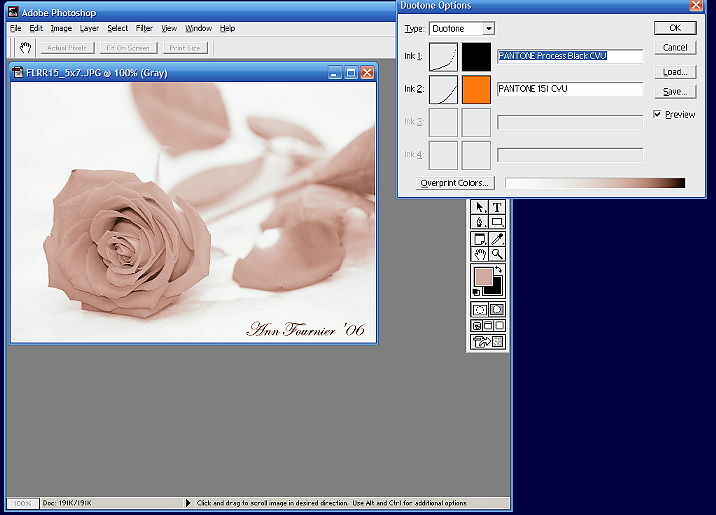 Click on "Layer", then at the bottom: "Merge Visible". You're ready to save to your final version. Click on "File", then "Save as..." and the box below will appear. 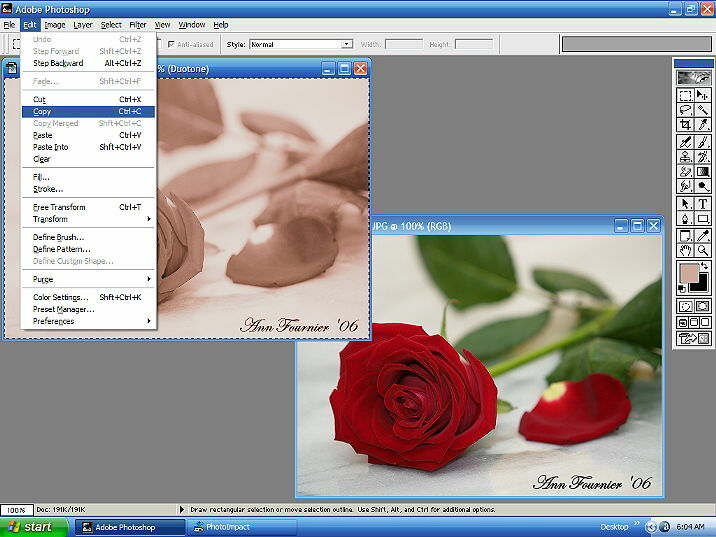 Click on the "Format" option box and choose "jpeg/jpg". Give it a name or save it as one of the other 2 filenames, but just remember to discard the one you don't need. After clicking the "Save" option, this box will appear. 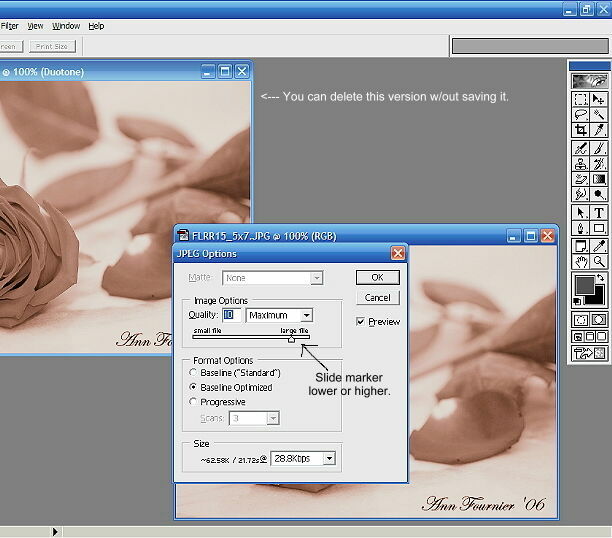 Slide the marker to the quality you want to save the file at. The lower the number, the lower the quality will be. You're done. 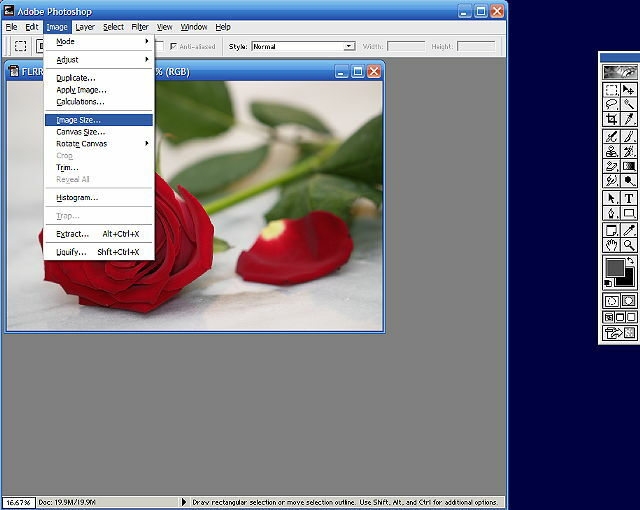 And the exif info should stay embedded in the file. If you see any errors or have any questions, send me a PM and I'll include it in the instructions.